The world’s most popular blended Scotch whiskies sell 100,000 bottles or more, every day of the year. With an operation on that scale, how do you maintain quality and consistency? It’s a never-ending task, as Richard Woodard discovers. Blended Scotch whisky is the bedrock on which the entire industry is built, outselling single malts by 10 to one. The world’s most successful malt brand wouldn’t even make the blends top 20 – and that’s not going to change any time soon. These best-selling blends depend on quality, consistency and individual character to maintain their popularity, but that’s no easy task when – to take the example of The Famous Grouse – you’re shifting roughly 1m bottles of whisky every 10 days. This is where the likes of Grouse master blender Kirsteen Campbell earn their corn: the daily blind sampling of new make and cask samples – nosing many thousands of casks a year – the constant checking at all stages of the process that the liquid won’t disappoint the final consumer. The process of preparing a batch of Grouse takes about a month and, with batches at varying stages in the process at any given moment, it’s a never-ending treadmill of liquid selection, blending, marrying, filtration and bottling. Let’s start at the beginning, though – new make spirit. 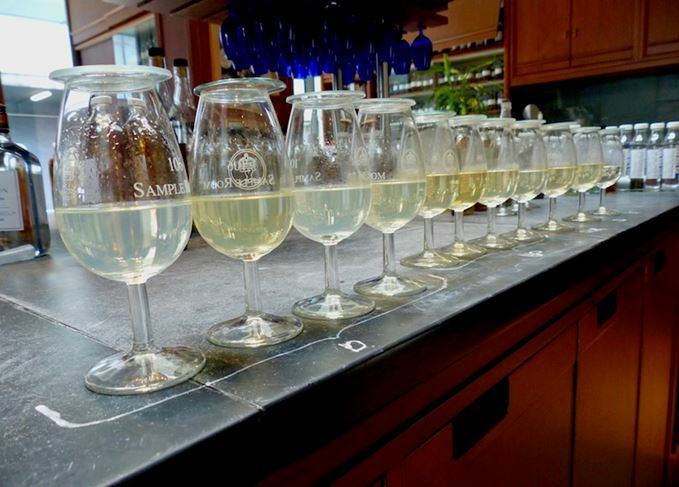 Campbell and the eight other members of the nosing panel assess samples blind on a daily basis, then check them against the distillery specification and give each sample a grading. After all, getting it wrong at this early stage will only store up problems for later. Anomalies are referred back to the distillery in question and, while most samples receive A or B grades, things can occasionally go awry. ‘It does happen,’ says Campbell. ‘But it’s never been so far out that it’s been a huge concern. There are trained people at the distillery, and they would normally pick it up beforehand. As a result, there’s a new make spirit ‘library’ in the company’s Glasgow sample room that includes three years of everything filled into cask – shelves groaning with clear spirit labelled Macallan, Highland Park, Glenturret, North British and so on. There’s the grain – and don’t for a moment imagine that all grain is the same. From the oily/solventy character of North British, to Strathclyde’s lifted bubblegum notes and Girvan’s pronounced fruit. All options for the blender. Then the malts: Glenturret’s oily citrus; the lifted fruit, perfume and gentle smoke of Highland Park; and the muscly Speyside duo of Macallan and Glenrothes. There’s plenty more liquid on the table, including something labelled Ruadh Maor: peated Glenturret, named after a red house submerged when nearby Loch Turret was dammed. It’s a key component – alongside Highland Park and an unnamed, third-party peated malt – of the Smoky Black Grouse variant. Running peated malt through Glenturret can create issues, though, especially when the distillery switches back to unpeated. ‘Sometimes we’ve got smoke in the new make for a while, but we put a C grade on it and we can always use it in Smoky Black Grouse,’ says Campbell. The next batch of samples shows more colour. All 6-7 years old and of various cask types, with Sherry to the fore and a charming first-fill Bourbon Glenrothes, all sweet fruit, honey and vanilla. The latter are placed into flavour camps so that, if one distillery is unavailable, another takes its place. ‘I always get asked how many whiskies are in the final blend, but it’s very hard to say,’ explains Campbell. Let’s say she needs six casks from a certain flavour camp; those casks might theoretically come from six different distilleries, or all from the same one, depending on suitable stock. Underpinning this process is a recipe: a secret one, of course, but one that encompasses distilleries and flavour camps, ages and cask types. For Grouse, the spicy, dried fruits from European oak are key, supported by toffee/citrus from ex-Bourbon, and creamy smoothness from Bourbon-matured grain. On this particular day, Campbell has nosed 82 casks, or one-third of the malt blend for the latest Grouse batch. Tankers are bringing more malt from the north; the entire batch will comprise roughly 1,000 casks in total. As well as assessing the suitability of the liquid, Campbell and her colleagues are also checking out the cask. Should it be filled again? It’s a decision based on taste, rather than a fixed formula that says casks should be used four or five times. Samples tested, you’ve got all the elements of your blend. Now the Edrington solera tank farm (a misnomer, as it’s not a solera at all), established in 2010, takes over. The whisky for the new batch, at about 65% abv, starts out in the buffer tanks: nine tanks of 500,000 litres each; six grain (five for Grouse, one for fellow blend Cutty Sark); three malt (two Grouse, one Cutty). Next the malts move into smaller marrying vats (15 of them, 100,000 litres each), reduced to 45.5% abv. This, says Campbell, is a vital part of the process. ‘Previously, we created the blend, reduced it to 45.5% abv, then filled it back into exhausted casks for resting,’ she explains. ‘But Grouse is a huge quantity, so it was a lot of work.’ The solution was to use the larger marrying vats instead, where the malt spends a minimum of 21 days. Once the marrying is over, malt is mixed in-line with grain, caramel and water are added, and the final blend goes into the four blending vats at 40% abv (or, rarely, 43%). Are we done? Not quite. Before bottling, time to chill filter the whisky to make sure that haze won’t re-form under cold conditions. For Grouse, this happens at the relatively warm temperature of 6C. The process is the same for all the Grouse expressions; only the recipe will change, from Mellow Gold’s higher proportion of malt, first-fill and American oak, to Smoky Black Grouse’s peated element and Gold Reserve 12-year-old’s more pronounced European oak Sherry character. Grouse, of course, is just one blend among many; firmly in the global top 10, but part of a family of multi-million-case-selling products that also includes even bigger sellers such as Johnnie Walker, Ballantine’s, Chivas Regal and Grant’s. The production of each of these will have its own quirks, variations and reasons for doing things differently, but at their core they are all aiming at the same target: quality, consistency and staying true to the character that has made them and, by extension, Scotch whisky in general, so popular all over the world.